We came home this week from our extended trip to Colorado to an overwhelming amount of produce to take care of. So in addition to getting the kids back into the swing of things at school and getting back into my normal rhythms, I have been trying to preserve lots of summer fruits and vegetables. 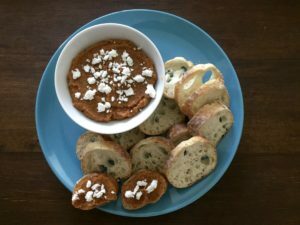 To use up tomatoes, peppers, and other summer vegetables I usually go with a huge vat of skillet tomato sauce and then freeze the extra for the winter, but this year I wanted to try some else as well: roasted summer vegetable dip. When I was a teenager one of my favorite meals was ratatouille. My mom would make it every summer and I would be in heaven for days (it gets better over time as the flavors continue to mix with each other). One summer we had some friends coming over for dinner and wanted to come up with a quick appetizer. We ended up pureeing leftover ratatouille, spreading it on thin slices of French bread, and toasting it with some fresh mozzarella on top. I thought I had died and gone to heaven. This recipe is a simplified version of that same deliciousness, because honestly when you are overwhelmed by the amount of produce threatening to go bad on your counter, or by general life craziness, who has time to stand over the stove keeping an eye on the ratatouille? With this recipe you jut roughly chop, throw it in the oven, and puree when everything is cooked. Pretty easy! I call this a dip but really it is so much more. You can use this as a pasta sauce (sort of like a pesto); as a topping or side with meat, fish, or tofu; as a replacement for pizza sauce; or as a spread in wraps and sandwiches. It also freezes well, so if you have any leftover just divide it up into little containers and save it for the winter when a little taste of summer will brighten your day. Preheat the oven to 450 and line two large baking sheets with parchment paper. Roughly chop the vegetables and combine in a large bowl. Pour 2 Tablespoons of extra virgin olive oil over them and stir until well coated. Sprinkle on salt and pepper to taste. Put in the oven and roast for 20-25 minutes, checking and stirring at the 10-minute mark. 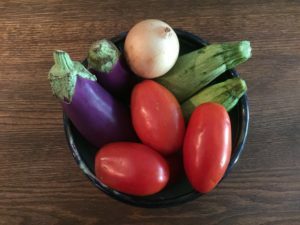 Remove when the tomato skins are starting to blister, the onion is starting to brown, and the eggplant and zucchini are just starting to brown. Put all of the vegetables into a food processor or blender along with the herbs, 1 teaspoon of balsamic vinegar, 1 teaspoon of salt, and pepper to taste. Puree until smooth. Top with feta (if using) and serve as a dip with pita or French bread, or use it in one of the other ways mentioned above.